Acqua di Parma Colonia Intensa is not a stronger, longer-lasting version of Acqua di Parma Colonia; Colonia Intensa is a brand-new fragrance. Colonia Intensa’s opening reminds me of Christian Dior Eau Sauvage, its mid-development recalls Annick Goutal Eau du Sud and its finish resembles Monsieur Balmain’s base notes. With such great precursors (and delicious-smelling ingredients), I found Colonia Intensa hard to resist. Colonia Intensa opens with ‘electric’ and ‘fizzy’ lemon-ginger accords. As Colonia Intensa develops I smell cardamom, soft cedar, sweet, not earthy, patchouli, and benzoin (imagine the taste and smell of a sour lemon drop with a spicy-resinous center). Colonia Intensa’s active layers of citrus and spicy woods flicker for a long time and seem to percolate on my skin, producing a feeling of euphoria (reason enough to use this fragrance in the drab days of winter). Colonia Intensa’s citrus and spice “heat up” in mid-development and lead to a warm, but buoyant, ending — featuring light leather and cedar accords, a hint of incense, crystalline patchouli and powdery musk. As noted in the first paragraph of this review, Colonia Intensa is not “original” — but its conjuring up of three of my favorite summer fragrances under one cap prompted me to buy a bottle. Of all the Acqua di Parma colognes I’ve tried, this is my favorite. 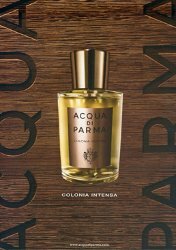 Acqua di Parma Colonia Intensa Eau de Cologne ($83-$112) has very good lasting power (but stays close to the body), and the Colonia Intensa scent is also available in a shampoo/shower gel and aftershave balm. For buying information, see the listing for Acqua di Parma under Perfume Houses. I just bought this for my husband. He likes the bath and hair gel, too. I think they have great fragrances and I would like to see them add a few more for women. Tom: AdP is VERY generous with samples so you can get a couple of big spray vials to try it out at N-M or Nordstrom (at the stores I visited there was a BASKET of samples for the taking). As Tom said: Thanks, I think. You've once again made a scent sound so delicious that I need to get myself to Nordstrom to try to snare a sample. Anything with a sunny citrus fizz makes me think of a perfect summer scent, though I understand what you mean when you say they can be great during winter's dark days too. I'm hoping that if I like this I can at least hold off to purchase this with my summer budget — remember, lean and mean 2008! I bought as one of his Christmas presents. I had the hardest time not giving it to him early. I have even sprayed it on myself and not because I wear unisex or men's fragrances. It smells divine–just what I think a man should smell like. I just love it. Joe: My bottle of Intensa will be in heavy rotation this summer…the samples I have of it will last me thru winter when I only put on citrus scents when winter depression hits HARD. The last few days in Seattle have been “balmy”…near 50 in daytime. Made for a man. . .but I like it, too. I'm a sucker for the lemon/ cardamom combination. I loved the original, but the drydown was too soapy to wear, so I sprayed it on towels and in the sheets, where the soapy part was fine. I'd also put a spritz in the dryer and the whole cellar would smell like summer. Since you don't mention the soapy dry-down, this will be a must try. I have this fragrance and find it very nice. It has a mild sweet musk smell on me after the citrus. It is very light and clean. When I bought this a month or so ago I said to my self that I think I have found my new Aqua di GIo. (before everybody started wearing it). Very good review. quinncreative: NO soapiness in Intensa thankfully. I've never paid much attention to Acqua di Parma's fragrances but now I'm really curious to try this one! eminere: this is a good one to start with…but do smell the original Colonia too. I was wandering through Selfridges, sampling endless niche perfumes which largely did nothing for me then WHAM! KAPOW! SPLAT! ZAMEEE! I encountered AdP's Intensa. This makes my nose itch in the kind of way it's delicious when someone scratches THAT spot on your back,. I want to lock myself in a room with no ventilation, smother myself in this and breath in so deeply that breathing out is parting of so sweet a sorrow that I can't wait to breathe in again. This is a fantastic fragrance. But SSSSHHHH!!!!! Keep it a secret otherwise the dull and ordinary unimaginative people that think that buying a celebrity perfume is a good idea will want some. And frankly, this is way too good to share with people who think that smelling like Victoria Beckham is a good plan. HDS1963: I know what you mean but I also would rather AdPCI be worn by LOTS of people rather than the dull ole mainstream stuff that litters perfume counters around the globe. This and the Absoluta sound like a dynamic duo to have in the cupboard or shelf. In 50ml form, they should be small, but perfectly formed; in shape and smell. I can see myself eventually becoming a collector like your good selves and shunning big value 100ml popularist stuff except for my Calvin Klein Eternity and Obsession. I suppose it helps if I’m partial to woody and marine fragrances.